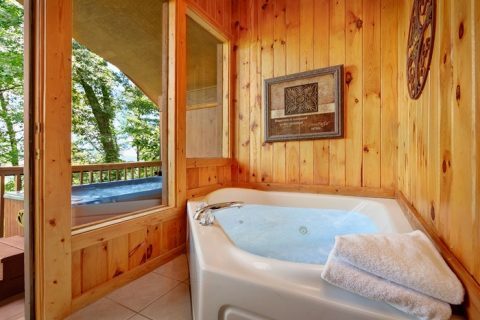 Ready to escape to the Smoky Mountains with the one you love? 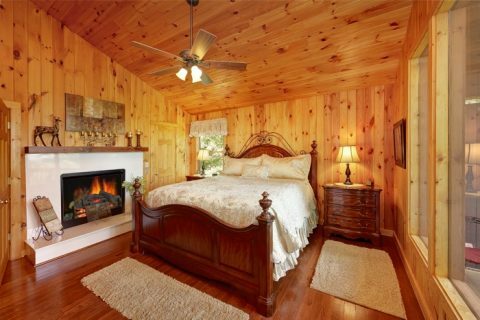 "Enchanted Evenings" is an excellent cabin for couples seeking a luxurious cabin vacation complete with top-notch amenities and unforgettable views. 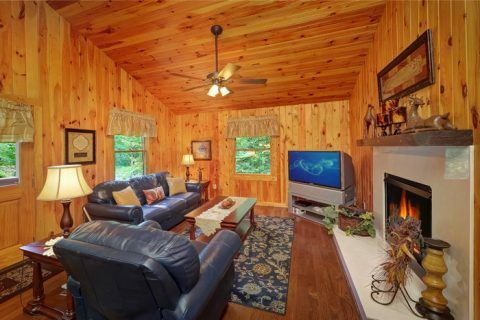 Whether you plan to explore Gatlinburg or nearby Pigeon Forge, this cabin on Pine Mountain Rd. 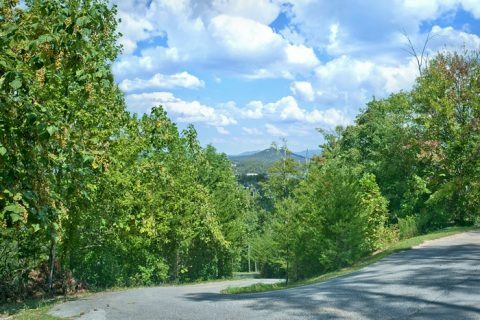 makes it easy to access main roadways to the top destinations in the Smokies! 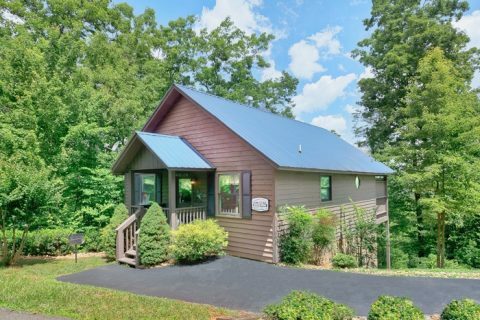 When you step into your premium, 1-bedroom cabin rental, you'll find a beautiful space that's ideal for sharing special memories with your sweetheart. 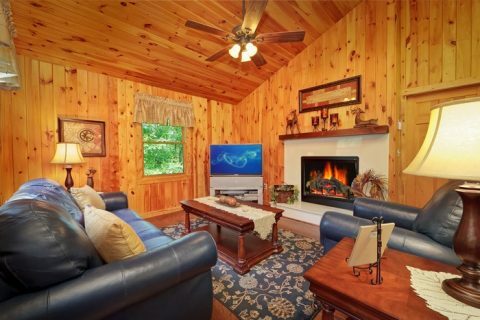 The rustic, wooden interior, comfortable furnishings, and gas fireplace create a welcoming atmosphere for your anniversary trip, honeymoon, or a spontaneous weekend away! 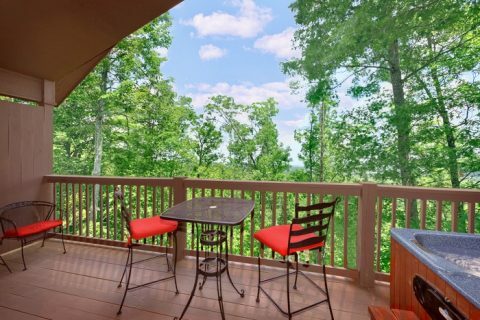 From your cabin's covered deck, you'll enjoy tree-top views of the Smoky Mountains and the valley of Pigeon Forge. Once the sun sets upon another great day in the Smokies, you'll see the exciting glow of lights from the nearby Pigeon Forge Parkway. 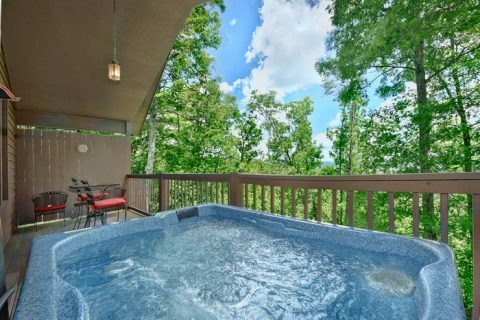 Sit under the stars in your hot tub and make plans for the future from your romantic cabin in the mountains. When you're ready for a restful night's sleep, you can look forward to your cabin's king-size bedroom suite complete with deck access, a fireplace, and a huge jacuzzi tub. 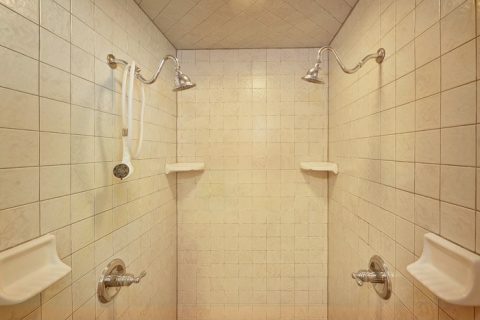 In your cabin's full bathroom, you'll find a unique dual-head shower for a truly relaxing experience on your vacation. Need more space for your vacation getaway with friends? 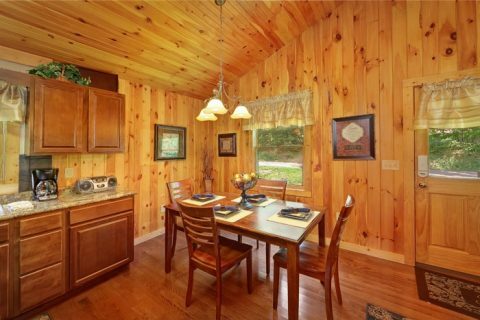 "Enchanted Evenings" can be booked alongside another nearby cabin named "Romantic Evenings!" 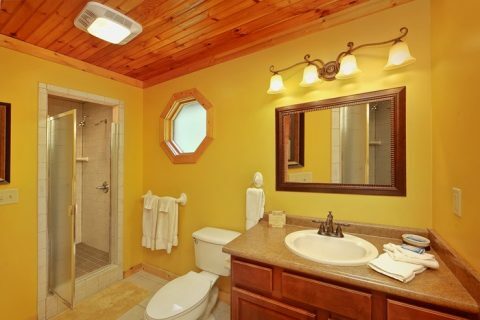 These two premium cabin rentals can be booked at the same time to accommodate more guests. If you're interested in hosting a multi-cabin vacation, please call our office so we can assist with the details. 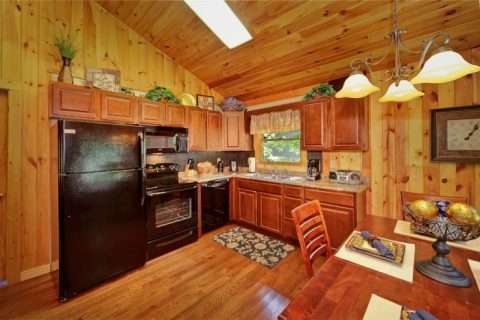 In the morning, awake to impress your partner with a hearty country breakfast and coffee to enjoy outside on your cabin's porch. Watch the sun rise on another beautiful day of your vacation and make exciting plans for your day. Will you visit Dollywood Splash Country? Explore shops in Downtown Gatlinburg? Laugh at a local dinner show? Take pictures of wildlife in Cades Cove? See panoramic views from the top of the Gatlinburg Space Needle? 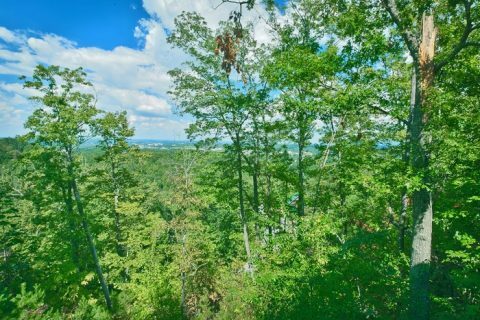 With so much to do from your convenient honeymoon cabin in the Pine Mountain area, you'll have a hard time choosing what to see next! 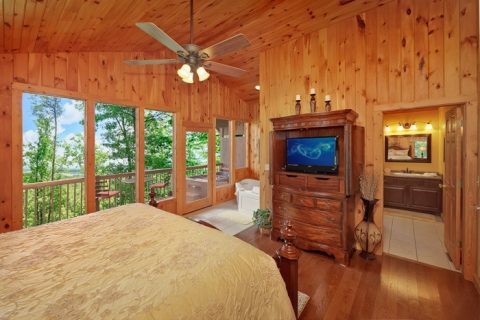 Better yet, when you book your Smoky Mountain honeymoon cabin online with Cabins USA Gatlinburg, you'll earn a terrific discount on your vacation lodging! 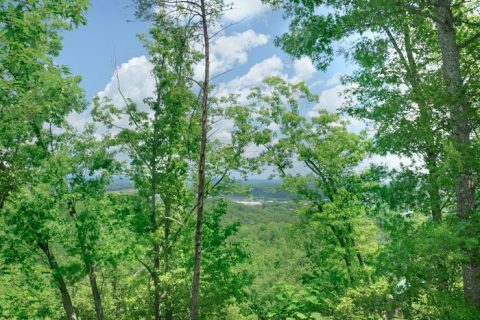 Save 15% and enjoy natural beauty, fun attractions, and excellent amenities during your authentic cabin vacation with the one who matters most!